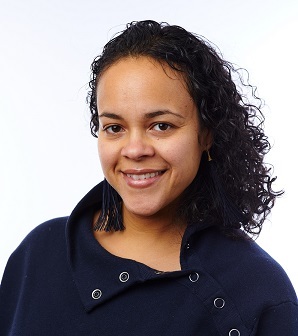 Dr. Leanne Yinusa-Nyahkoon is an occupational therapist with over 18 years of experience working with children with disabilities and chronic health conditions, the majority of whom are from urban communities of color. Yinusa-Nyahkoon is a clinical assistant professor in the Department of Occupational Therapy, College of Health and Rehabilitation Sciences: Sargent College, Boston University. She also serves as a research scientist in the Department of Family Medicine and a research associate in the Department of Obstetrics and Gynecology, both within Boston University School of Medicine. Yinusa-Nyahkoon’s research focuses on examining health disparities that disproportionately affect underserved populations by understanding the clients’, families’, providers’, and community’s perspectives of health risks, social circumstances, environmental factors, cultural and family norms, and individual characteristics that impact health behavior and illness management. Her current funded research projects include Using Innovative Communication Technology to Improve the Health of Young African American and Black Women and Men: The Gabby and Gabe Projects. The multi-disciplinary Gabby and Gabe research teams have developed and are currently disseminating a web-based health education system that assesses approximately 150 preconception health risks, and delivers evidence-based interventions to minimize identified risks and facilitate health behavior change. Recently, Yinusa-Nyahkoon’s research interests have also expanded to interprofessional care. She is participating in a grant titled “Interprofessional Education and Expansion of the Primary Care Workforce: Developing a Collaborative Learning Model in Urban Underserved Patient Centered Medical Homes” and is examining the perceptions of interprofessional care experience of clients, health professional trainees, and health care providers.